Truly wireless technology has been a game changer in the world of headphones since its inception 3 years ago! 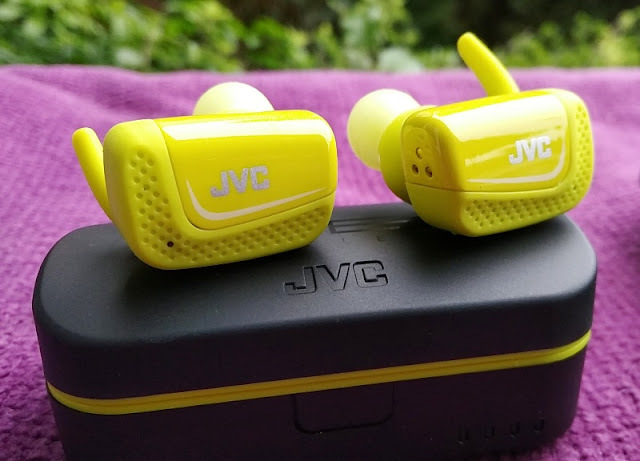 The latest player in the game of true wireless headphones is JVC with the HA-ET90BT-Y wireless sports earbuds without cords which can work stand alone as mono earbuds. 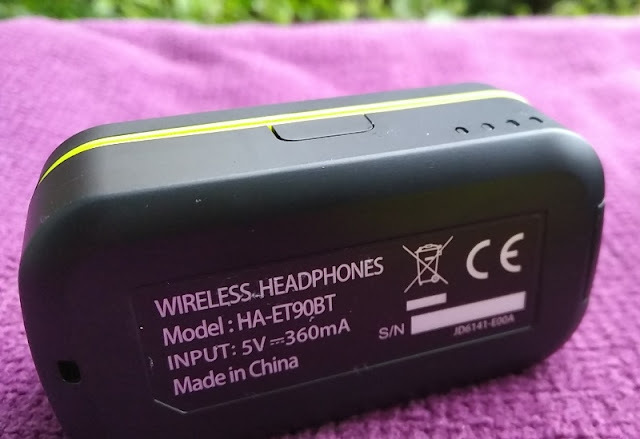 Being stand alone means the HA-ET90BT earpieces can be used independently from each other, so you can listen to music with one earpiece while letting the other earpiece charge. 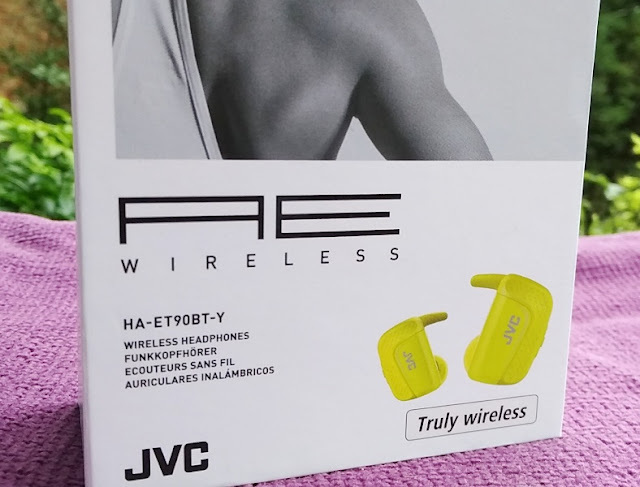 The JVC HA-ET90BT wireless earbuds are part of JVC's new AE Series sports range, which come in yellow color (HA-ET90BT-Y) and black color (HA-ET90BT-B). 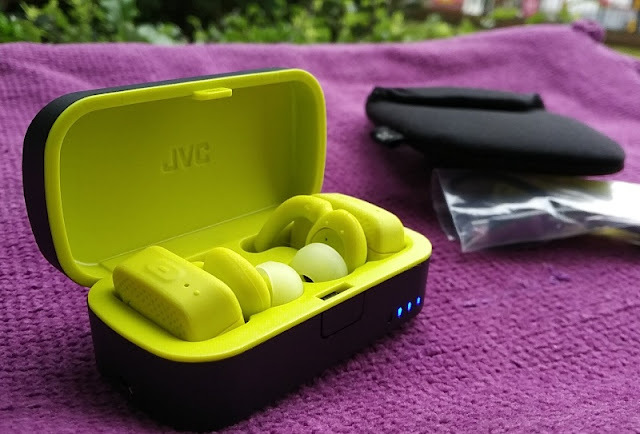 The JVC HA-ET90BT earbuds feature Bluetooth 4.2 wireless connectivity that supports A2DP, AVRCP, HFP and HSP Bluetooth profiles so you can remotely play/pause and control the volume of the audio playing on your smartphone. You can also accept incoming calls from your phone via the left earpiece where the built-in microphone is located. 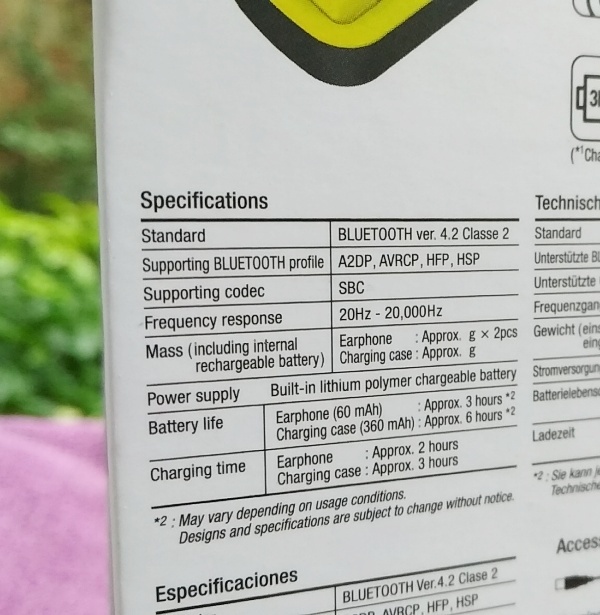 The A2DP Bluetooth Stereo profile integrates SBC (sub-band codec) which enables high quality stereo audio over Bluetooth. SBC works similarly to aptX and AAC audio codecs. 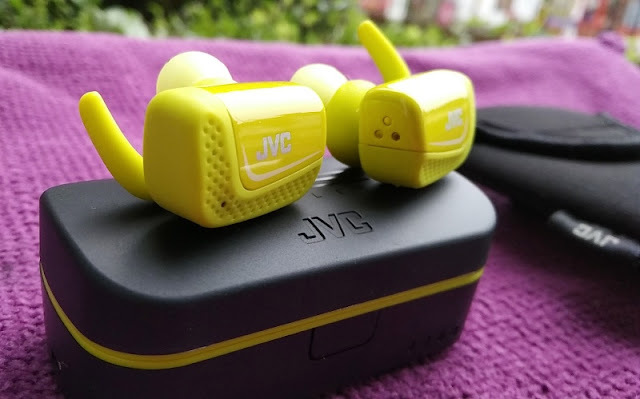 The JVC HA-ET90BT-Y earbuds have a frequency response range between 20Hz and 20kHz so you get a natural, flat sound without overwhelming bass. The volume can be turned up to a decent level. As far as fit, the HA-ET90BT earbuds insert comfortably inside the ear canal at an angle and stay put thanks to angled nozzles. 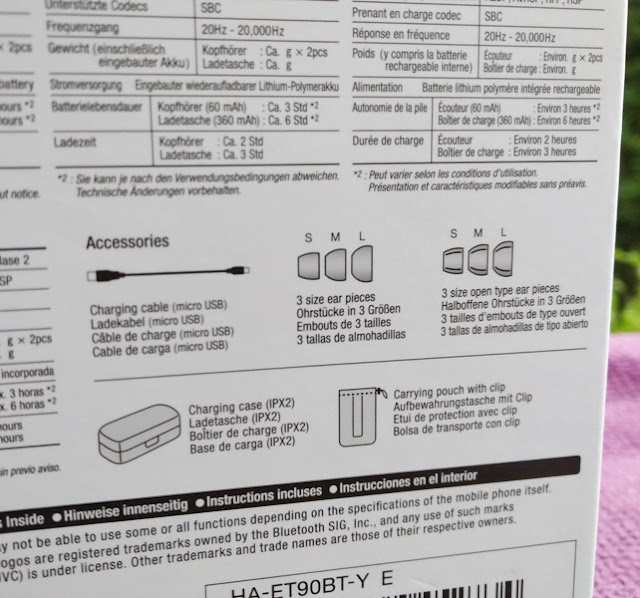 The body and nozzle tips of the HA-ET90BT earbuds are both made of a gloss shiny plastic. 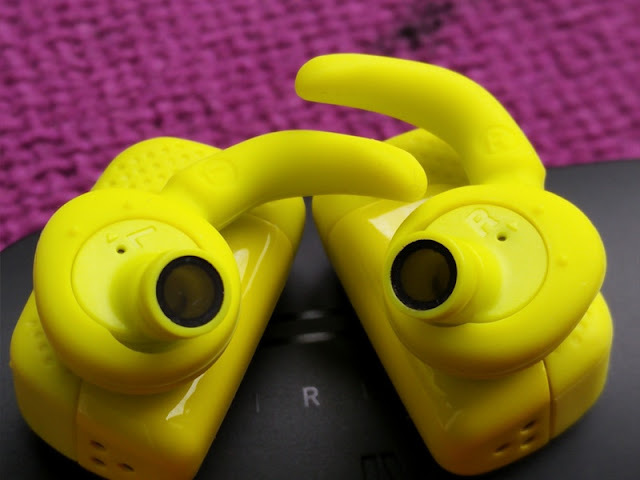 There are also rubber ear fins integrated in the HA-ET90BT earpieces which provide a more secure fit in the ears. These rubber ear fins can be rotated (clockwise or anticlockwise) to your liking. 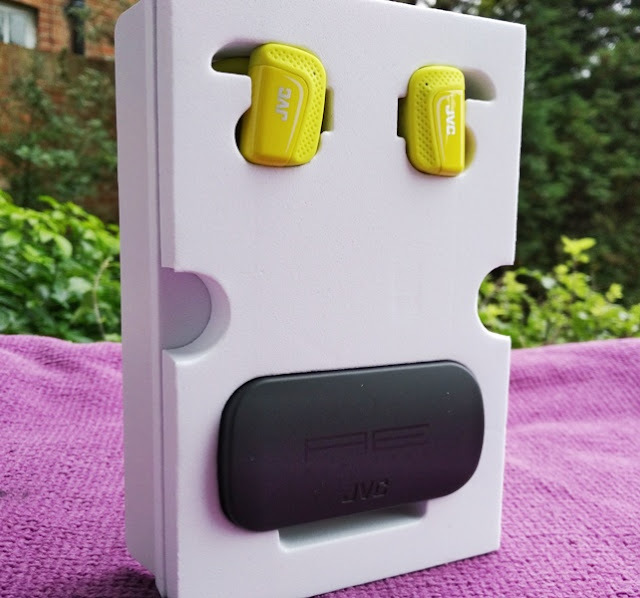 The HA-ET90BT-Y charging box is made of plastic and it's fitted with a 360mAh lithium polymer rechargeable battery that takes 3 hours to fully charge and gives you 6 hours of extra battery life for the earbuds. 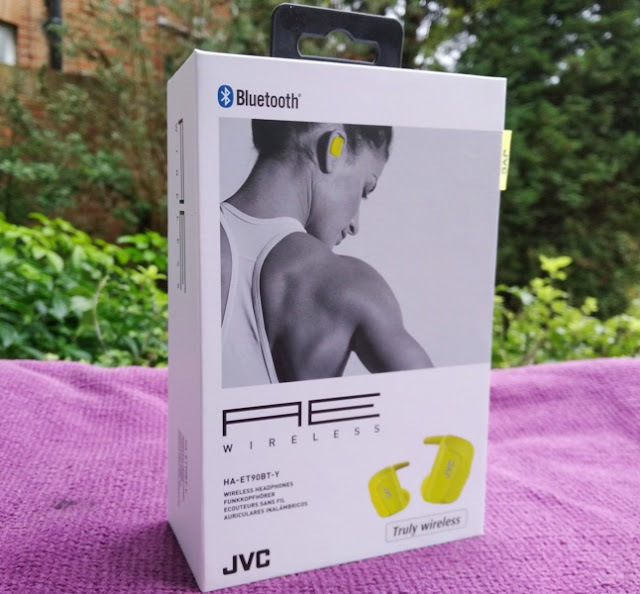 The HA-ET90BT-Y earbuds are fitted with 60mAh lithium polymer rechargeable batteries which take 2 hours to fully charge and last around 2.5 hours. 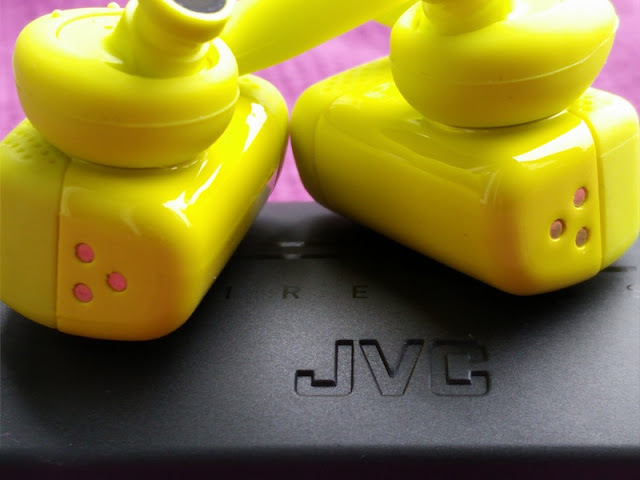 When fully charged, the charging box can fully charge the JVC HA-ET90BT-Y earpieces twice over. 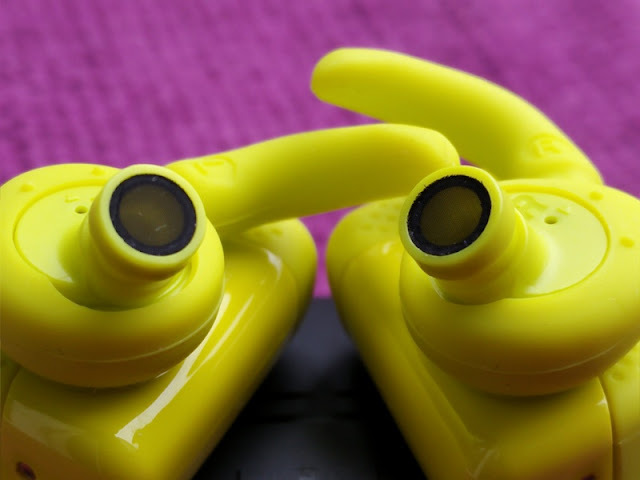 User control buttons consist of single multi-functional buttons on both ear pieces which control the volume as well as the play/pause of audio. 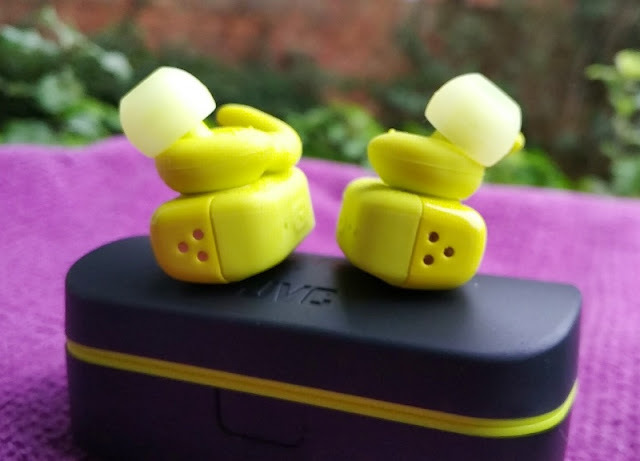 As far as pairing, the HA-ET90BT are easily paired to a device thanks to a simple pairing process where you only have to pair one earbud for stereo audio. 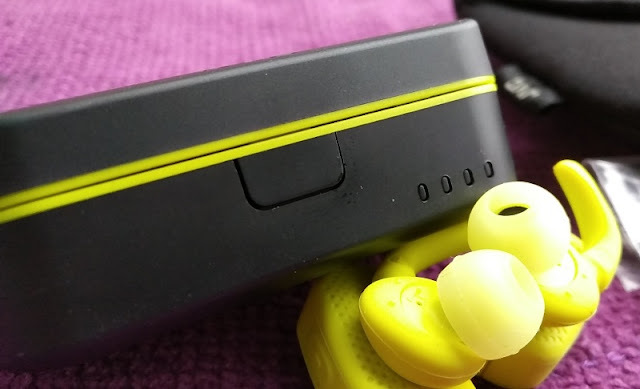 Once one earbud is connected to your phone, it's just a matter of powering on the other earbud which will connect to the paired earbud automatically. 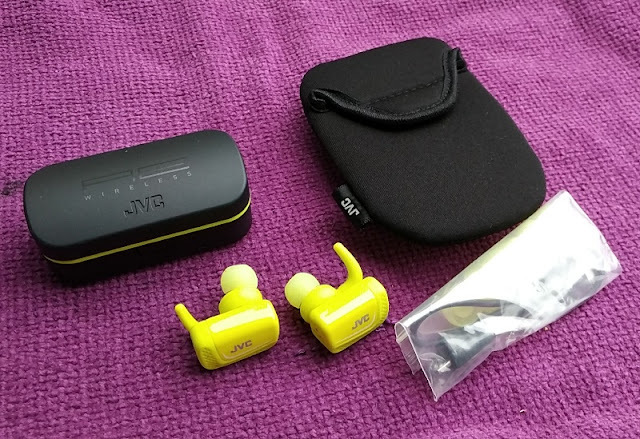 You can also pair both earbuds with your phone for mono audio. 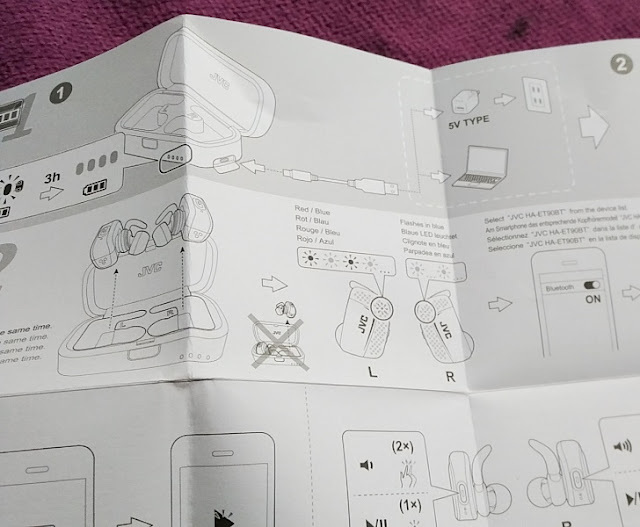 To volume down you press the button on the left earbud twice and to volume up, you press the button on the right earbud twice. Playing and pausing the audio can be done from both earbuds by pressing the multifunctional button once. 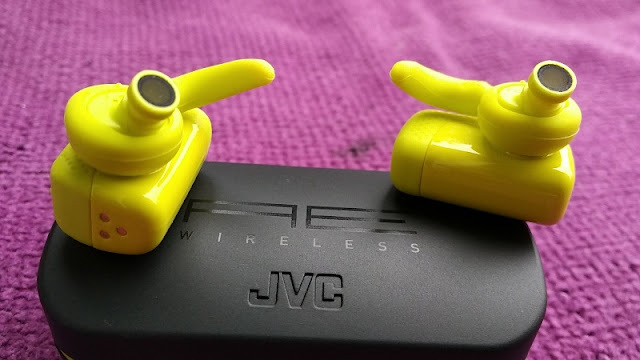 Both the HA-ET90BT-Y earbuds and carrying case are water resistant but not submersible. 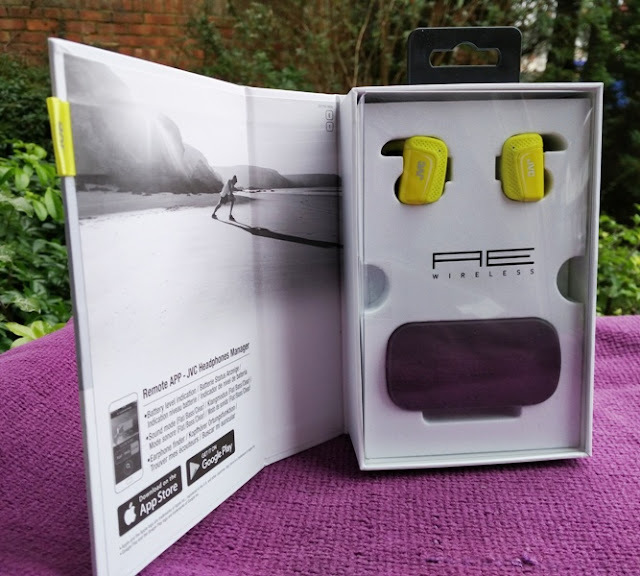 You can rinse and shake the earbuds under running tap water for 3 minutes without damaging the earbuds thanks to IPX5 water resistance protection. 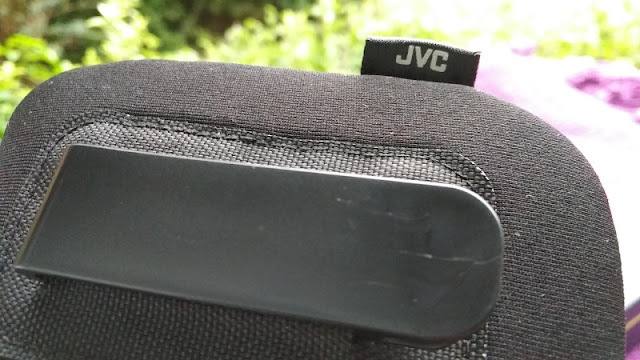 The carrying case is drip proof (IPX2 rated). 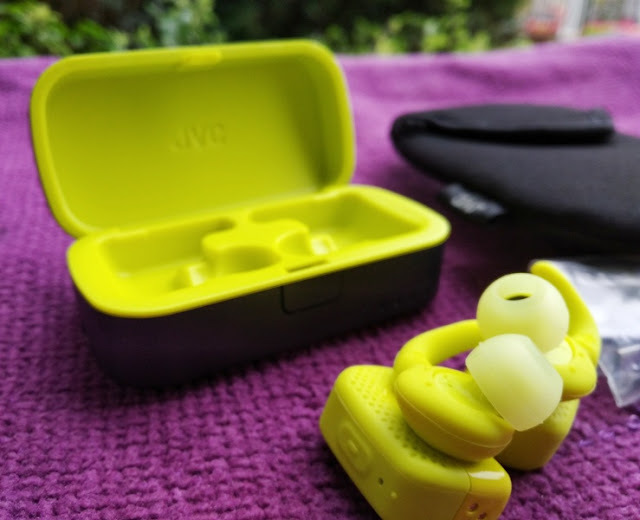 IPX2 rating means the HA-ET90BT earbuds carrying case can prevent dripping water from entering for several minutes as long as the case is not tilted. 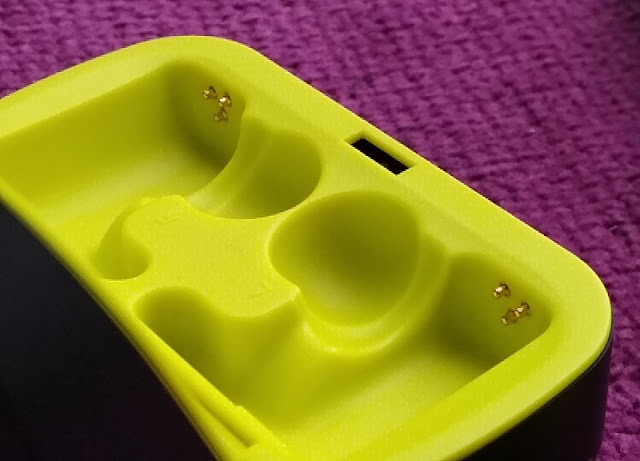 Another thoughtful feature you get integrated in the charging case is four LEDS to indicate battery power remaining. All four LEDS light up when the case has a full charge (100%). Three, two and one LEDs lighting up indicate 75%, 50% and 25% (low) battery life remaining. 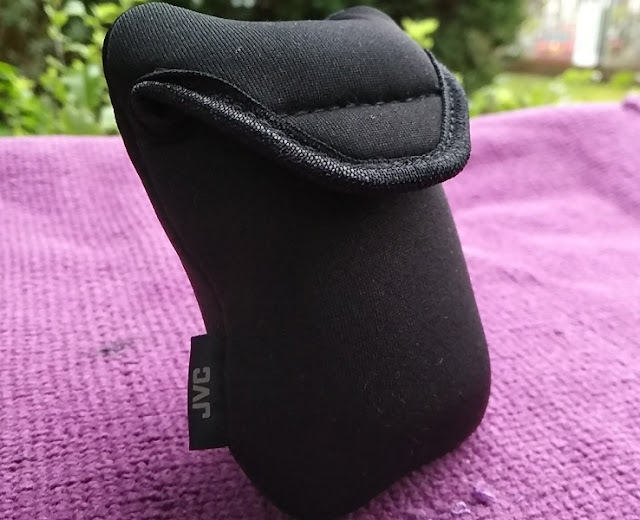 Other accessories you get with the JVC HA-ET90BT-Y earbuds include a micro USB charging cable, three different size of ear tips (small, medium and large) and a soft neoprene-like carrying pouch with clip. 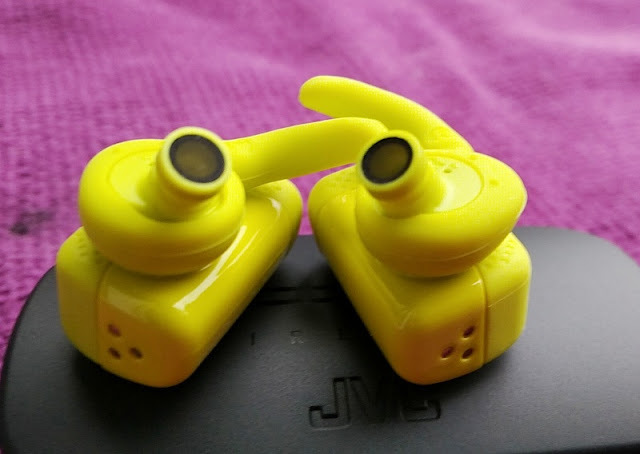 The ear tips that come with the JVC HA-ET90BT earbuds come in two types: standard silicone ear tips and ear tips with tiny holes to allow in background sound for situational awareness. 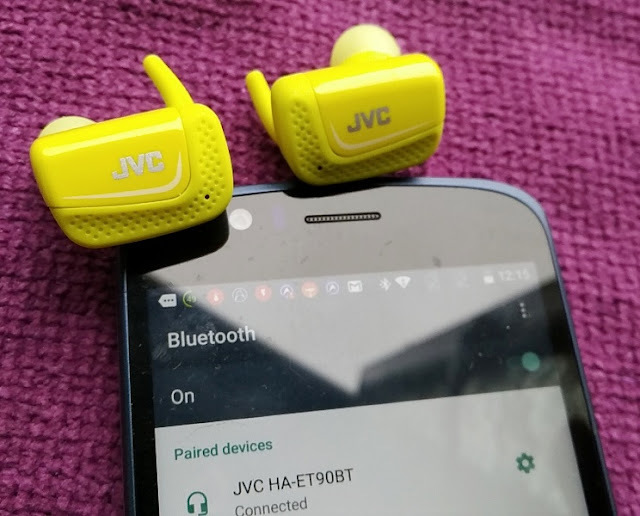 The JVC HA-ET90BT-Y earbuds are also compatible with the JVC Headphones Manager Remote app which allows you to check the battery life of the earbuds, as well as adjust EQ settings from your phone. 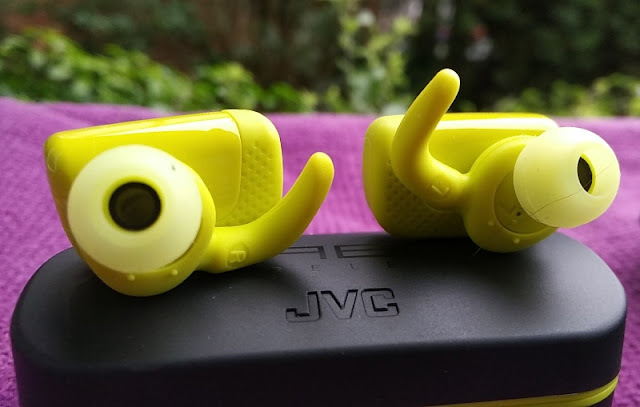 You can also use the JVC app as a remote finder to locate your earbuds should you lose them.The JVC Remote app is available for both Android and iOS devices.